Much of this film will seem familiar to anyone who's seen 1947's "Kiss of Death", which plotwise it closely resembles, and some of the theme music heard over the opening credits was borrowed from 1951's "The Day The Earth Stood Still". That having been said, however, this film has much to recommend it on its own. Most critics disapproved of Robert Evans in the title role, but I found him very impressive: funny and likeable one minute, menacing and really frightening the next; the stuff of any true psycho. The film isn't without flaws; the direction is frankly uninspired, and several opportunities missed. 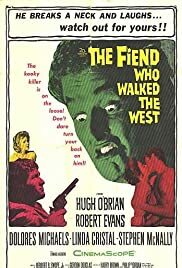 But Evans (in one of his last roles before giving up acting to become a producer) remains fascinating to watch; he's very unlike any other western villain you've ever seen. Emile Meyer (as a brutal prison guard) and Stephen McNally (as a good guy for a change) offer strong supporting performances; Hugh O'Brien is his reliable self as the hero.